Mission Statement: Our mission at St. Peter Lutheran Church is Christ's mission - "I will build my church" by developing fully devoted followers of Jesus Christ. Worship is Saturday at 5:00 PM & Sunday 9:00 AM followed by coffee and learning time at 10:00 AM. 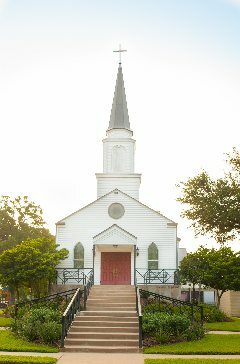 Our address is 100 N. Promenade St. Hallettsville, Texas. We are located at the corner of N. Promendae & E 2nd St in Hallettsville, Texas. "And I tell you, you are Peter, and on this rock I shall build my Church, and the gates of hell shall not prevail against it." Solid Rock Christian Center for Learning, Inc.
Mission Statement: "With God at our center and parents as our partners, we will nurture the total child--emotionally, physically, and spiritually." Solid Rock Christian Center for Learning accepts children from the age of 6 weeks through 12 years old. After-care is available for students through age 12. The hours are Monday through Friday from 7:00am--6:00pm. For further information, please call during business hours (8a-5p) @ 361-798-3799.